This is a product which is multi function detectable pin hole camera and other monitor wireless products, with bright red LED, can find out all mini camera, pin hole, button and mobile camera etc. Easy to operate, small dimenssion and portable solution unit. Multi function detectable pin hole camera and other detect wireless products. Detectable RF frequency from 1MHz to 6.5GHz for all FR frequency include GSM, WIFI BT, FM, VHF, UHF, 900 / 1200 / 2400 wireless audio and video transmission frequency. 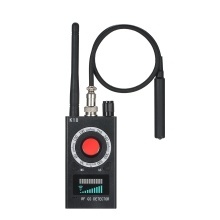 Built in bright red LED,can find out all hidden camera, pin hole, button and mobile camera etc. Built in 400mA rechargeable LION battery, operation time up to 6 hours for lens detector and up to 15 hours for RF detector.